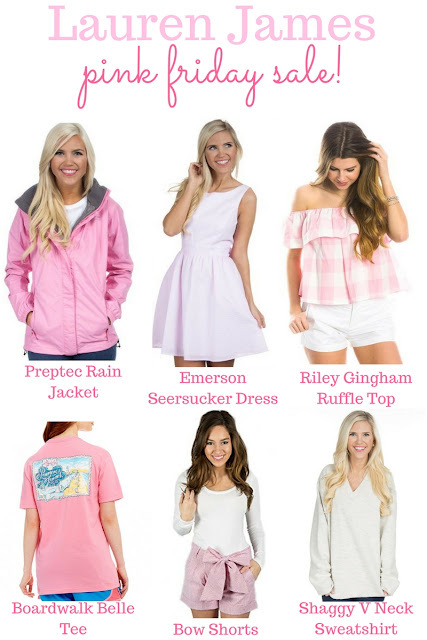 Lauren James Pink Friday Sale! Exciting news! Tomorrow (June 30) is the Lauren James Pink Friday Sale! Lauren James is one of my favorite brands because of their timeless pieces that can be easily dressed up or down. From their Sweet Tee collection to off the shoulder gingham tops to seersucker dresses, their pieces are perfect for any occasion. This is a sale you won't want to miss! Some items will be marked down up to 85% off. This is a great time to look for game day dresses, recruitment outfits, swimwear, and comfortable tees. I've put together some of my favorites below! Be sure to head to laurenjames.com on Friday at 12:00 CT to shop! I hope you find lots of pieces you love! What would you like to snag at the sale? I did not know about this before but will definitely be doing some shopping!! So glad I read this!